More chocolate goodness in your eyeshadows, from Too Faced. A number of makeup brands have studied and improved upon the first two Urban Decay Naked palettes, adding versatility and different tones and finishes to their own neutral palettes, going beyond brownish/taupe shade ranges. There are rose-, caramel-, peach-, purple-, and even slate-hued neutrals now, in fun packaging. Too Faced has even added (slightly spicy) chocolate fragrance to both their neutral palettes, which is a huge stress-buster in the mornings, believe me. The Too Faced Semi Sweet Chocolate Bar eyeshadow palette is a Spring 2015 offering from the cruelty-free brand. It is not a sequel, but a standalone neutral palette - the original Too Faced Chocolate Bar palette had come out in Spring 2014 and is reviewed and swatched here. While the packaging of the Semi-Sweet palette looks milkier than the deeper original, the shades inside are warmer and there are more orange/caramel-based neutrals while the original was cooler- and burgundy-brown centric. 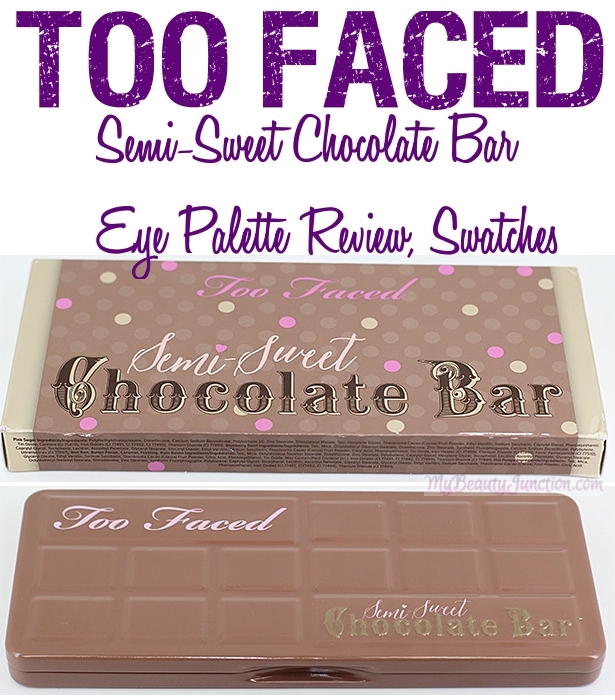 Read on for my review and swatches of the Too Faced Semi-Sweet Chocolate Bar palette. The new Semi-Sweet palette is designed to resemble a chocolate bar. The metallic packaging is lightweight and identical to the original except for the shade. It reminds me of a pencil-case I used to own in school. Size-wise, the Semi-Sweet palette is the same width but a tad slimmer than the original, and is more milk-chocolate than dark-chocolate. The Semi-Sweet palette has names for individual eyeshadows printed on the palette itself, above each pan. The original palette had the names printed on a separate clear sheet. The original has better/firmer magnetic closure. As with the original, you get a little guide for very neutral, romantic and smoky eye looks. Both guides have the same names for the three looks - Milk Chocolate, Semi-Sweet and Haute Cocoa. Incidentally, the first two are eyeshadow names in the original Chocolate Bar palette. There is the one shade I hate, called Pink Sugar, which is a gritty, chunky-glitter-fallout mess. Apart from this, I LOVE everything else. The other shadows are smooth and silky and easy to blend, without much fallout. Pigmentation, apart from Pink Sugar, is very good; exactly what you expect from a Too Faced palette, and I had no creasing problems all day whenever I've worn these shades - though I must warn you that I always use eyeshadow primer. The shades, like in the original Chocolate Bar palette, are infused with antioxidant cocoa powder and smell of amazing, addictive, heady chocolate. I have NO idea what the shadows taste like, TYVM. Shade-wise, the original palette had cooler colours while the new palette is warmer. Both palettes have the same length; ignore my weird photo collage. Both palettes have 16 eyeshadows each, of which the highlighters come in bigger pans. I would have loved to see a matte black in a bigger pan; I'm always needing matte black to serve as eyeliner. Coconut Creme: Matte ivory-beige. Similar to White Chocolate from the original palette; but I prefer the latter as the former was a tad sheerer. Truffled: Matte chocolate brown; Semi-Sweet in the original palette is more ruddy. Hot Fudge: Shimmery deep brown with grey undertones. Cocoa Chilli: Half a tad deeper than Truffled, but with sparse gold glitter that doesn't appear on swatches. Pink Sugar: DISGUSTOID. 'Nuff said. Oh okay. Pink-and-gold-with-chunky-glitter-and-fallout mess, then. Blueberry Swirl: Dusty deep blue with grey undertones. Peanut Butter: Matte warm orange. Gorgeous on my skintone, if I say so myself. A more orange version of Salted Caramel from the original Chocolate Bar palette. Frosting: Bronzier brown version of Hazelnut from the original. Rum Raisin: A proper taupe. Shows up with slightly rosy shimmer on my skintone, but mine is the only medium/tan skintone swatch I've seen so far. Mousse: Close to Milk Chocolate from the first palette; a tad paler and more caramelly. Bon Bon: Rosier version of Caramel. For me, the winners in this palette are Nougat, Peanut Butter, Caramel, Bon Bon and Blueberry Swirl. The loser is Pink Sugar. Boo! I've swatched with tape, for a (somewhat) neater (than usual) look; Pink Sugar and Coconut Creme needed multiple swipes to show up with Pink Sugar almost half-used from the pan for this one swatch. Ugh; which twit thought it was a brilliant idea to include this shadow in this otherwise amazing palette? Row 2: Blueberry Swirl, Peanut Butter, Frosting, Rum Raisin, Mousse, Caramel, Bon Bon and Butter Pecan. You already know I love this palette. So it all boils down to one question. 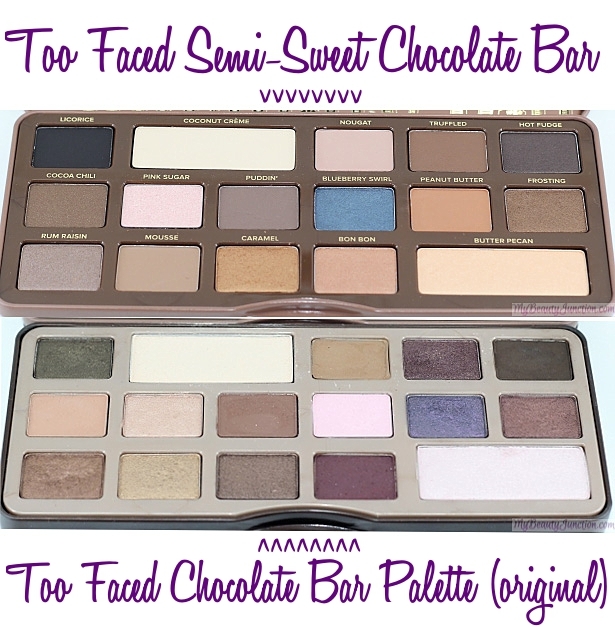 Do you NEED the Too Faced Semi-Sweet Chocolate Bar palette? If you love warm colours and chocolate and neutral eyeshadows, then YES, you do. If you love chocolate anything and cutesy packaging, then yes. Ignore Pink Sugar. You can depot it or layer it. The original Chocolate Bar or the Semi-Sweet version? I love orange tones and blue as much as purple-based neutrals, so I'm going to say both. And, because the caramel-neutrals and the burgundy-neutrals complement each other. It is a matter of personal choice, really. However, if you asked me to choose between the two UD Nakeds (love the third UD best) and these two, I would say these two any day. Several brands have improved upon UD's neutral shade choices, so I no longer reach for the first two Naked palettes these days.